I almost started crying watching this video. 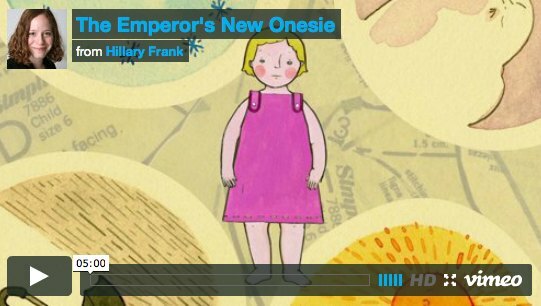 The Emperor’s New Onesie is a story many of us can relate to. When I think back to how upset my Vman was as a baby, I wonder what would have happened if I had let him be a naked baby… snow in Chicago be damned! Vman cried CONSTANTLY as a baby. And the entire time, people kept telling me tricks to deal with his issues. As an infant, people, including our caring pediatrician, kept telling us that he was just fine. Hey, babies cry, right? As pediatricians and the general public learn more about Sensory Processing Disorder, I can only hope that one more mother doesn’t have to spend the early years hating herself and wondering what she’s doing wrong. For those of you who want to know what children with tactile defensiveness can be like, here is one girl’s story about her reaction to clothing from her mama’s point of view. Brought me to tears. Still to this day, when my son comes home from school (4th grade), he drops his backpack and jacket, kicks off his shoes, peels off his socks and drops his pants onto the floor. Every. Single. Day. Thank goodness he’ll wear clothes… just not blue jeans or pants with a zipper and button (too hard to button and unbutton). And I don’t have to worry about PJ bottoms because his legs always get too warm in bed for them. Sounds like my son. T-shirt immediately at home as well! I swear he’s going to become a Popsicle with the winter weather but he’s so much happier. Oh. And now my son will at least wear boxers to bed. Tears. Oh how far we’ve come though. Thanks for the post! Yes. This video really did move me to tears. And we have all come so far. With the change of weather, I still hear the pain in his voice of putting on his jacket, but it will only last a month or so until it disappears and he once again gets used to the feeling of weather heavier garments for winter. Tears.. So remember these days. My son still drops his pants or shorts at the door, but trades them for softer material clothing. Yep. My son is in boxers and a t-shirt within seconds of walking through the front door. This was and is my daughter to a tee! She has a closet full of “cute” clothes that I buy or others buy that she will not wear. I have a booming account at a consignment store! Her daily outfit is no undies with shorts, camisole and flip flops. Thank God we homeschool because having to dress appropriately for school was a nightmare. She has one outfit for “going out”. A long pair of gym shorts (boys), a camisole with a cute lace over layer top. She is a 9 yrs old who is starting puberty and my current fear is when she starts her menstrual cycle. I look back fondly at pictures of the first couple years of her life when she would let me dress her but then I remember the battles. So now we have no battles.